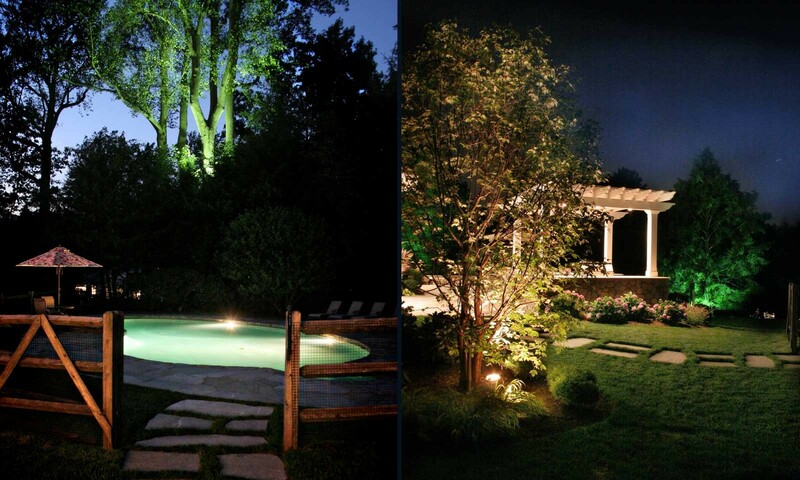 Whether you are taking an evening dip in the pool or grilling up some dinner for the family, your custom landscape lighting design will make the task at hand possible. But more than the improved visibility the lighting provides, it also adds ambiance to the space. The subtle glow emitted from the pool (pictured above) in New Canaan, Connecticut, is reminiscent of a luxury resort, while the uplighting on the trees in front of the pergola creates an alluring space that would otherwise be rather gloomy in the evenings. Basic outdoor lighting leaves a lot to be desired. Most Connecticut homes put a light on the porch, and possibly some pathway lighting on the walkway, and leave it at that. While these light sources are crucial for visitors in the evenings, they leave a lot to be desired as far as the home’s aesthetics are concerned. 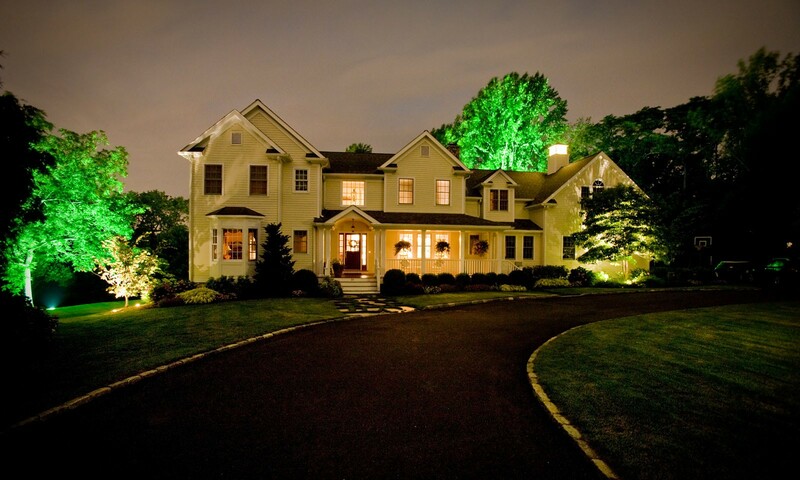 The landscape lighting design for this home in New Canaan, Connecticut, ensures that the home looks just as gorgeous during the nighttime as it does during the day. The uplighting of the trees—especially the 130-foot-tall tulip tree in the rear—puts emphasis on the varying sizes and locations of the greenery around the home to add multiple dimensions to the property when the sun goes down. 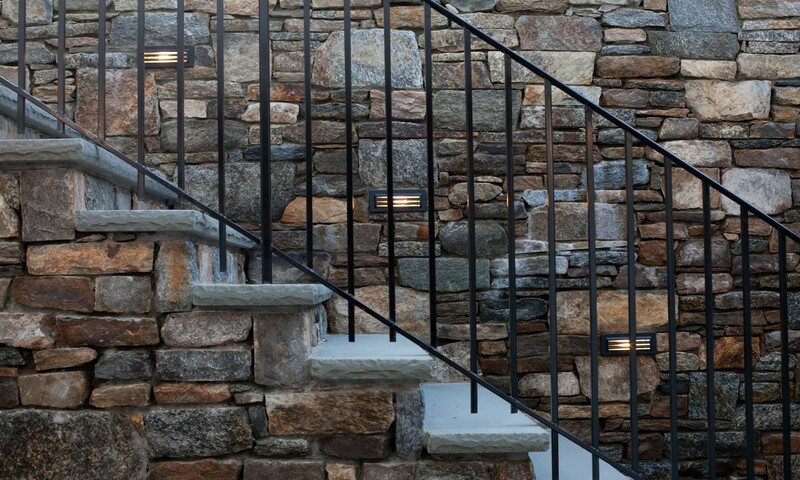 While the functionality of providing a light source on a staircase is certainly important, our landscape design for this staircase was also about emphasizing the impeccable masonry it was made of. This stunning staircase in Darien, Connecticut, was meticulously handcrafted using the finest fieldstone in the state, so it should be visible no matter what time of day it is. We opted for flush-mount lights that were built right into the masonry so that we did not detract from the beauty of the stonework, while still allowing ample lighting so the staircase could be traveled safely. At Odd Job Landscaping, we believe that landscape lighting design should be approached carefully and creatively. We use soft and subtle lighting to bring depth and beauty to your yard when the sun goes down, while always keeping functionality at the forefront of our designs. What’s more, we can include hidden junction boxes on your Connecticut property so more landscape lighting design can be added in the future. To see how amazing your landscaping can look in the evenings, contact Odd Job Landscaping today.